Two Southampton men have been sentenced to a combined 13 years in prison after a haul of guns and ammo was found at a flat in the city. Hampshire Constabulary’s Serious and Organised Crime unit seized firearms and ammunition from a flat in Albion Towers, Golden Grove, Southampton as a result of an intelligence led warrant on Tuesday 29 October 2013. Two large holdalls full of weapons and ammunition were seized. 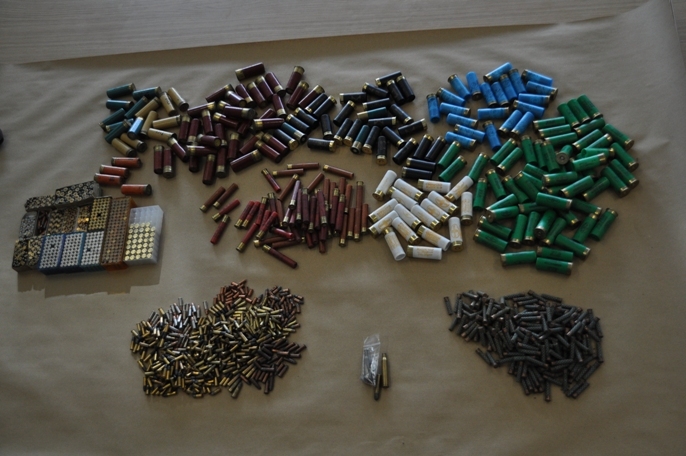 “This haul of firearms was being stored at the flat. We have no evidence to suggest that the weapons have been involved in recent crime; however the fact that many were operational and stored with ammunition suggests they had a criminal purpose, although not necessarily for use in Southampton. “This case demonstrates the success of the Operation Fortress project to tackle drug related crime in Southampton. It was as a result of intelligence gathered by the Operation Fortress team that this warrant was obtained, an excellent investigation by the serious and organised crime unit followed and led to successful convictions for serious firearms offences. Two men arrested and later charged in connection with this investigation have been sentenced today (Monday 24 February) after pleading guilty to possession of firearms and ammunition. Peter Castle was sentenced to five years for s5 firearms and ammunition, 3 years S1 firearms and ammunition, to run consecutively (total eight years). Thomas Graham was sentenced to five years.